FIRST EVER CHAINMAILLE KIT FOR TWEENS – based on the historic art of chainmaille, used by knights and kings as protection and adornment, re-invented as fashion art by Neat-Oh! and Rebeca Mojica, chainamaille guru. MAKE 5 STUNNING NECKLACES OR BRACELETS by linking hundreds of colorful rings. EVERYTHING YOU NEED in one kit; Hundreds of metal rings, crystal clear instructions, videos to go along and a magic patent pending tool. 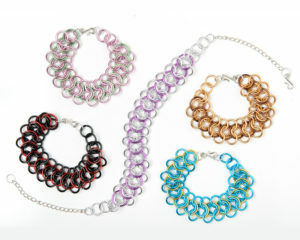 ARTISAN DESIGN; Together, Rebeca Mojica, world renowned chainmaille artisan & Neat-Oh! created Linkt® Craft Kits. MAGIC PATENT PENDING LAYOUT TOOL included, which help transform pieces of metal rings into a stunning piece of jewelry. With Linkt® Craft Kits, tweens can make professional artisan quality jewelry in 30 minutes or less. Linkt® Craft Kits was designed together with Rebeca Mojica, world-renowned chainmaille artisan and award winning jewelry designer. They are super easy, fun and simple to make. In one single box, you have everything you need to make many amazing creations faster than you think. The metal is soft enough that you can bend them by hand but strong enough to make lasting, stunning real jewelry. Kits also include crystal clear instructions; videos to go along (on YouTube) and a magic patent pending layout tool that is lightweight and soft with slots that hold rings while you work. 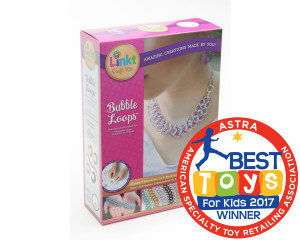 Linkt® Craft Kits Bubble Loops comes with enough metal rings to make a 5 stunning necklaces or bracelets. Designs don’t look easy, but we’ve made them easy for you.